Nutrition tailored to the reproductive growth phase. 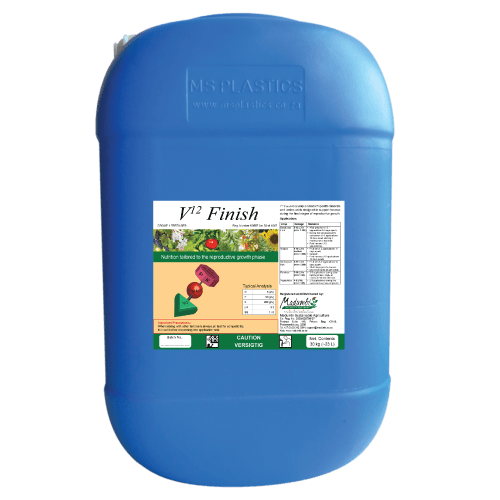 V12 Finish is a unique blend of specific minerals and amino acids designed to support the crop during the final stages of reproductive growth. Deciduous Fruit: 5-12 L/Ha (min. 1:200). After petal fall (1-2 applications 14 days apart). During fruit enlargement & colouration (1-2 applications 14 days apart starting 1 month prior to harvest). Grapes: 5-10 L/Ha hectare (min 1:100). Fruit set (1-2 applications 14 days apart). Veraison Post harvest (1-2 applications 14 days apart). Subtropical fruit: 6-12 L/Ha (min 1:200). Fruit set (1-2 applications 14 days apart) 30-40 days prior to harvest Use lower rates on soft citrus. Potatoes: 5-10 L/Ha (min 1:40). 2-3 applications during tuber bulking phase. Apply at minimum 14 day intervals. Vegetables: 4-8 L/Ha (min 1:40). 2-3 applications during the reproductive phase of growth. Important Precautions: When mixing with other fertilisers always jar test for compatibility. Mix well before dispensing into application tank. Optimises fruit full and ripening. Assists the plant in achieving maximum yield potential. Improves fruit size and quality. Biostimulation of the reproductive phase – fruit full, colouring and shelf-life. Potassium and phosphorus in V12 Finish assists fruit full, ensuring maximum yield potential is achieved.